When inspecting Table Grapes there are quite a few defects you should be on the look out for. The most serious defects are decay and split berries. Scarred berries and bunches weighing less than a quarter of a pound are very commonly found. But there are a few others; some commonly found and some you may be surprised to hear are even considered a defect. Take a look at the picture below. There are three different defects visible. See if you can identify them. Were you able to pick them out? See the enlarged image below to see if you found them all. Grape number 1 was the easiest to identify. It is call shattering, as the grapes must be firmly attached to the capstems to be considered a U.S. No. 1 Grape. Grape number 4 may have been difficult to detect in the original picture, but you can definitely see juice on the berry. Whenever juice is on a leaking berry or on a sound berry it is a defect. The defect is called “wet and sticky berries” and is considered a serious damage defect. 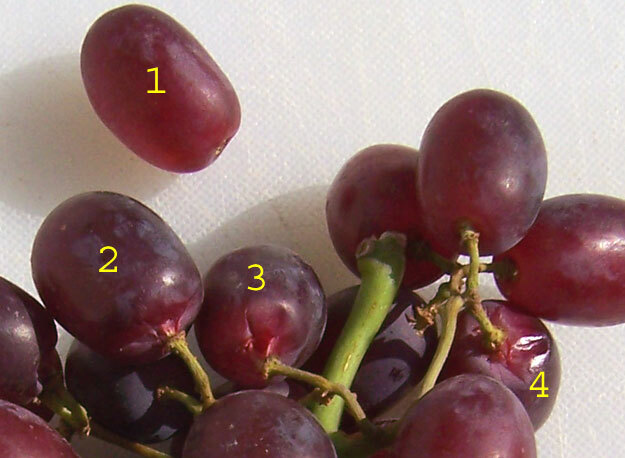 Grapes number 2 and 3 are the most controversial. You may have seen this time and again in previous loads of grapes, but you never noticed the USDA Inspectors scoring these grapes as defects. You may have overlooked them yourself. 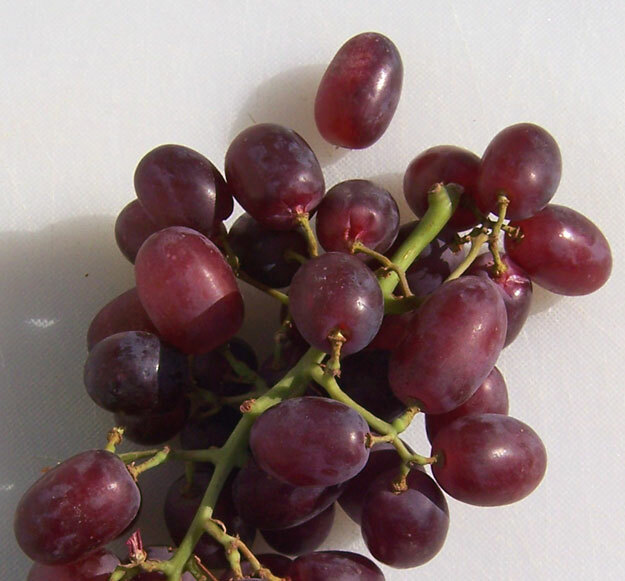 What makes this defect confusing is the fact the U.S. Grade Standards for Table Grapes require the berries being firmly attached to the capstems. Who’s right and who’s wrong? The USDA has done a poor job ensuring uniformity among their inspectors. Their Inspection Instructions do little to address this defect, thus the confusion. I have noticed the scoring or not scoring of this defect varies not by inspector but by office. Personally, I began my USDA career in Philadelphia. We inspected literally millions of lugs of grapes from Chile. We were trained on grape inspection by the USDA experts from Washington, DC and from California. During my time in Philly we never scored “weak at the capstems” as a defect. Our office consisted of about 15 inspectors at the time and we all were uniform in our inspections. It wasn’t until I traveled to Hunts Point (Bronx, NY) to help out and I was inspecting a load of grapes on the market that I found out about this disparity. When I completed my inspection and reported my results to the applicant he asked me “What about all the weak at the capstems?” I was taken back, thinking to myself, “What is he talking about? Which ones were weak at the capstems?” Speaking with other inspectors from that office I discovered they see and score that defect all the time. And their inspection certificates backed up their statement. So again, who was right and who was wrong? Maybe we we wrong in Philadelphia to ignore this defect, or maybe those in Hunts Point went overboard. Unfortunately there is no uniform guideline or policy on the scoring of berries being weak at the capstems. My suggestion is to use common sense. If the berries are dangling from the stem, and there are numerous berries that would detract from its appearance, then by all means score them as a defect. But if you have to hunt and search to find a berry here and there as being weak at the capstem then ignore it, as it probably will does not detract from the appearance of the bunch. This post is filed under Defect Identification.